The online book The Cob Builders Handbook by Becky Bee has a chapter on "Choosing your Site " and its following chapters provide some further hints and considerations. As an additional thought; there is not one way to do a yurt or dome as each place or site has its own character, and circumstances. For example in Switzerland we have areas with a lot of fog in fall which can last for weeks, a few kilometers away you have sunlight during those weeks above the fog line - e.g. calculating with thermal solar energy during fall. Sites near large amount of water, such as a lake or sea you experience more mild climate than within the country as the water operates as balancer of extremes (delay of warming up and delay of cooling off from season to season). cold & wet climate: challenging, as 100% waterproof cover and thermal insulation is required, and water condensation within thermal insulation needs to be avoided (drain or re-evaporate/reverse condensation if it occurs). Should a full year with its four seasons include multiple of the above listed conditions, you may preferable remove or add layers of insulation and change the setup as required. Here in Switzerland, where we experience the four seasons in their mild version: winter we have snow, rarely below -15°C, usually -7 to -5°C from December to late February (usually the coldest weeks), and summer time we have 25-30°C, rarely more - the recent years though we experienced more extremes: long winter til April (see my Yurt Diary and entry April 2006) with a lot of snow, and hot summers but also following long period of rain. 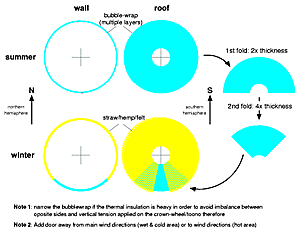 Anyway, what I'm trying to say (again), look at the climate closely where you put the yurt, in my case I keep bubblewrap for spring to fall, and then reuse it as pseudo-window along with semi-transparent rain cover (such as lightweight white PE), to have daylight entering through roof and wall and not just the skylight like traditional yurt all year long as I really appreciate the yurt the modern style so to speak with light or bright interior. At heavy winds the temporary building may require to be anchored like a ship with ties to the ground as due its lightness it may not provide sufficient wind resistance. There are some general issues to be consider when chosing a temporary building, and this is if your region you use a temporary building has snow, e.g. in winter time. 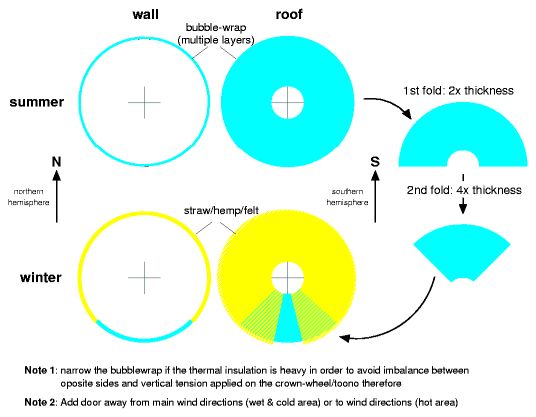 dome: the roof has a steady curvature, and for the top area of the roof there is no snow sliding to be expected (without wind), and snow weight expected - I recommend you have an opening skylight so you can access this area easily to push it down with tools. 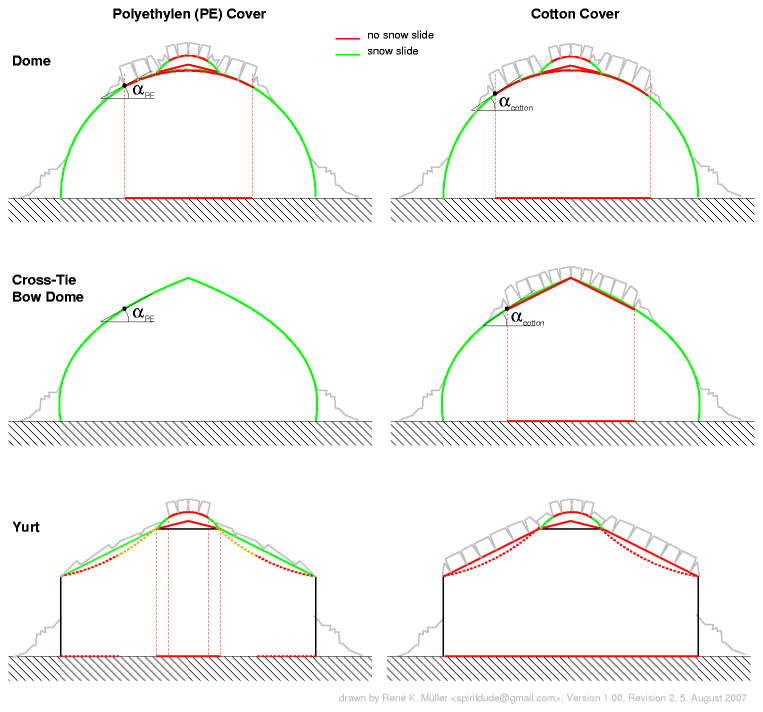 yurt: the roof is no curvature but a steady sloope or roof angle in the ideal case, depending of the used roof poles they may bend and make the roof in the mids flatter, e.g. bamboo roof poles bend about 10-15cm on a length of 3m, which changes the angle there; make sure the snow can slide and remove any hindering facture such as ropes over the cover so the snow slides easily. 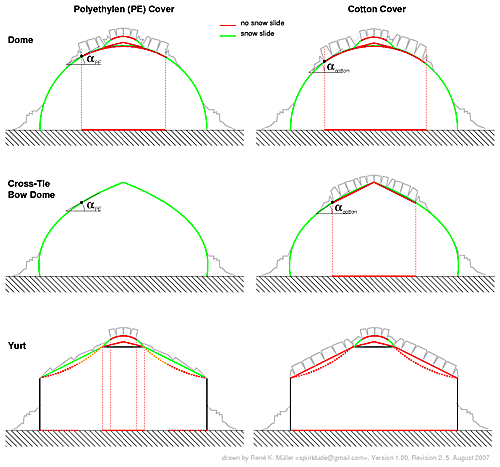 dome: since the required angle must be steeper the area of non-slide of snow gets bigger than for PE cover. 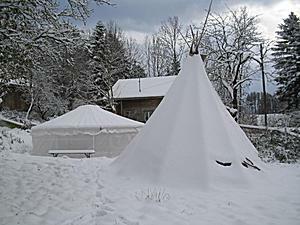 yurt: snow doesn't slide on cotton usually, not even cotton/polyester mixture - and I generally do not recommend cotton (& polyester mixture) for winter-setup with snow; e.g. you may get a PE for the winter to have snow slide and after spring remove it and use cotton mixture. 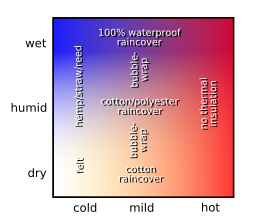 dome: have access to the top most area to push snow away, under strong wind condition this may not be necessary, PE preferd over cotton as cover. 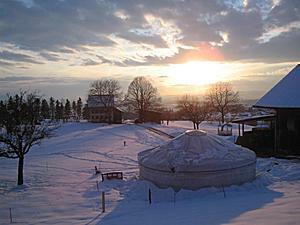 yurt: use material with sliding quality, e.g. such as PE or alike material, and choose α > 25° (e.g. 28-35°) for the roof.